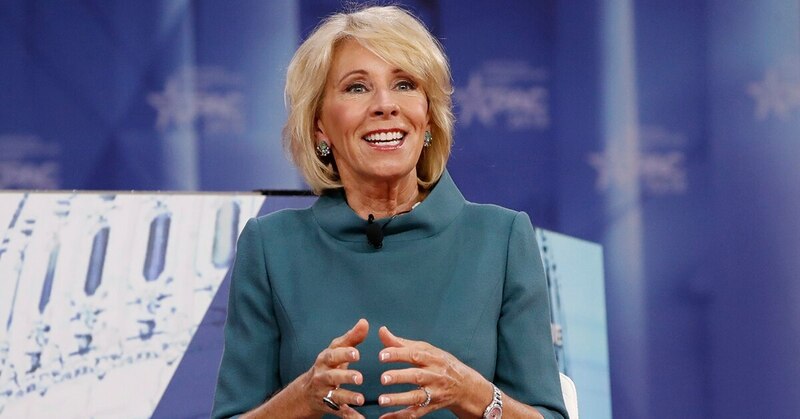 WASHINGTON — Education Secretary Betsy DeVos on Thursday called for allowing military families to use federal funds to pay for private school or other educational services for their children. The idea is part of Trump administration’s focus on expanding school choice — alternatives to traditional public schools across the nation. DeVos said that many active-duty military families living in bases were dissatisfied with their neighborhood schools and that was affecting their career decisions. DeVos said that one way to improve the situation was by setting up education savings accounts where the parents would receive government funds earmarked for them in the public schools system. They can then use this money to pay for online classes, charter school courses and other options. Similar state programs let families pay for private school, private instruction, therapy for special needs students, textbooks and other services. “The support for education freedom and choice in education is broad and wide,” DeVos added. DeVos made the comments in conversation with Kay Coles James, the president of the Heritage Foundation, a conservative think tank in Washington. The Heritage Foundation is promoting one such education savings accounts proposal for military families, but an Education Department spokeswoman said that DeVos wasn’t endorsing any specific plan. “There are several pieces of legislation that could make that happen and she look forward to working with Congress on this issue,” said department press secretary Liz Hill. The proposal backed by Heritage would make the funds eligible to an estimated 126,000 military-connected children across the nation if they are not happy with their neighborhood schools. Currently, there about 400,000 students in various private school choice programs nationwide, so the reform could potentially increase that number by nearly 25 percent. Heritage has been working on this idea with Rep. Jim Banks, R-Ind., and a bill is expected to be introduced in the near future. Public school advocates are highly critical of DeVos and her school choice agenda, saying that it drains money and resources from public schools. Correction: This version of the story has been corrected to say that DeVos did not back the Heritage proposal, but was expressing support for the idea in general.